Start by attaching the tray using florist wire, bind wire or pipe cleaners. Remember, the idea with this wreath is that all items can be removed and used. Next, add the two tea towels. I first added a bit of hot glue to one of the tags and placed the other towel tag on top of it to attach the two together. Then, attach the towels to the wreath using wire through the tag hanger. The plastic wine glass and margarita glass can be added to the bottom of the wreath using wire to wrap around the stems to the wreath. Now it’s time to add the bow. I made my Funky Bow using several ribbons that coordinate nicely with my color scheme and attached it to the wreath using florist wire. Continue adding items to fill in your wreath. I attached items either with wire or a bit of hot glue where it could be removed. Cut apart your flower bushes so you have individual stems. Attach them where you have empty space in your wreath using hot glue. Lastly, cut pieces of greenery ( I used silk ivy) and hot glue in any empty space that remains. Here are more pictures of the finished wreath! Make sure to scroll down to watch the how to video. 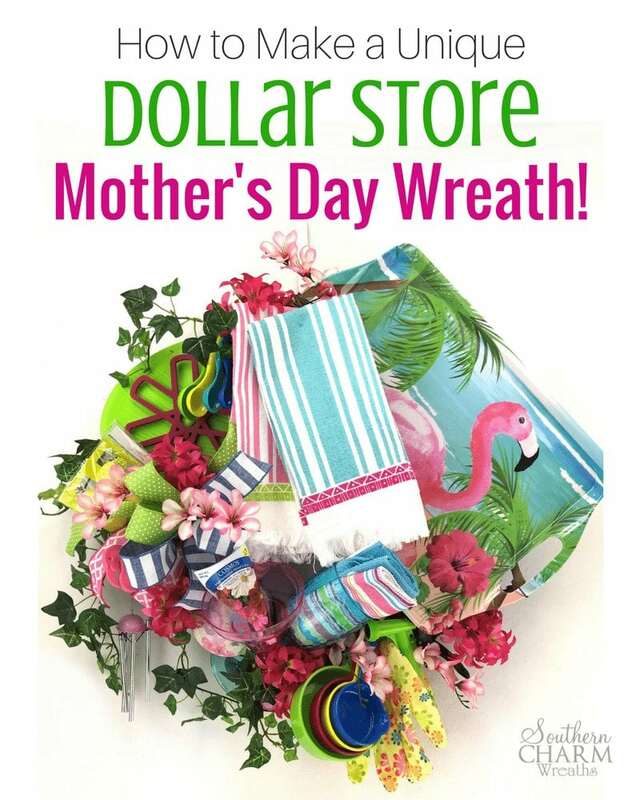 I hope you enjoyed this unique Dollar Store Mother’s Day Wreath tutorial! There are so many other ideas for a wreath like this as well – birthday, graduation, retirement – what else can you think of? Dont think I’m feeling this one. As with anything you do, the technique can be adjusted to fit something else and in this case the tray could be a sign, then flowers or small ornaments but as is? I don’t like it. It’s okay, but it’s not one I would put on my door. But if you like it, that’s all that matters. But you have made some beautiful wreaths. I love this idea…..not so much loving the result. You’re a great teacher and to listen and follow you is a great joy. As I said I think this idea is great but not sure how I would have changed it to make it turn out better. It’s not a FAIL but maybe a MISS in my book. Your creativity always amazes me! Great idea! I watch you make some of this wreath live . Personally not for me but appreciate you thinking out of the box for us . Yes I think could make us use it for other things . I thought this was really cute. It’s not your everyday wreath and it is certainly out of the box and that is what I love about it. Hey Julie! I actually made this for a giveaway at a ladies weekend retreat and it was a big hit!!! I had so much fun making it and it was so easy and it didn’t cost me an arm and a leg. Everyone loves a doorprize! I wrapped it in clear plastic and put a beautiful matching bow on ..,and it looked amazing! The lady who won it was so excited!!!! Thankyou for the idea!!!! Julie, the wreath is very creative and really cute. Out of all your wreaths, it’s not my favorite but it’s still very cute. Everyone’s taste is different and there’s nothing wrong with it. Example, something with pink flamingos has to fit in a certain persons personality so, this wreath is one of those. It’s great to reach out and make something “out of the box” you are fabulous and you are very creative in many ways. This is an example of that. Love you to pieces. Love this!! I love that this is affordable & possible for anyone to make. Any mother would love getting something like this. Would be great to change it up for a housewarming gift or for a newborn baby gift. Endless possibilities. Julie, Everyone has their own opinion. I always learn so much from your teachings. You always have a method our idea that I can apply to my wreaths. I have watched a lot of tutorials and some I do not like everything about BUT I always learn from them. Keep on doing everything just like you are doing. Do not get dishearten by critics. You are a very talented young lady and a Christian, you rank very high in my opinion! This wreath is an “out of the box” type of design. It is not your everyday wreath that you would hang on your door in my opinion. 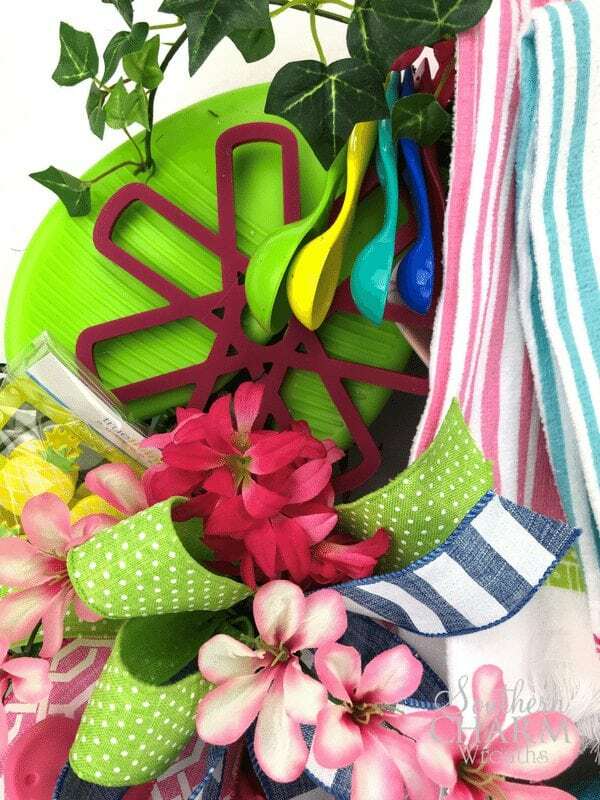 This particular wreath is made to be BROKEN down and the items are to be used for everyday enjoyment (Mother’s Day Gift). Personally I would not hang on my door, but USE the items. That is why this is considered a Mothers Day Gift. Keep an open mind, it is just like the eatable fruit in a flower design or chocolates. Everyone has different opinions and that is ok too. If you did not want on your door, you can just hang on your kitchen wall or USE the items. You could use less or more on this particular wreath design (items you want to give as a gift). There are many possibilities for this kind of style wreath just keep an open mind about it.. I thought it was very creative and beyond cute! It may not be something I use “as is”, but gave me a lot of ideas to “think outside the box” on something different! I wish my Mother was still here to give her a cute, creative wreath such as this. I love your teaching style, always pointing out what you are thinking and why you think that way AND that you do not have to use the same products that YOU use. I don’t want to make everything exactly like the teacher and all the other students. So thank you for encouraging coloring outside the lines! I loved it! Love it! Baby items are a theme I’ll be doing. next. Thanks for the ideas you post. I would not give this to my mother because it isn’t her style but it is a good idea. Baby shower. Weddings. Any occasions. You always do a great job. Julie, the wreath was not what I was expecting..but ended up being a lot cuter after you finished…after video finished! I never would have attempted incorporating a tray on a wreath! !I think your purpose to show that you can use inexpensive items for a wreath gift was met. I love this wreath. I love all of your wreaths. Unfortunately, this is not my cup of tea. 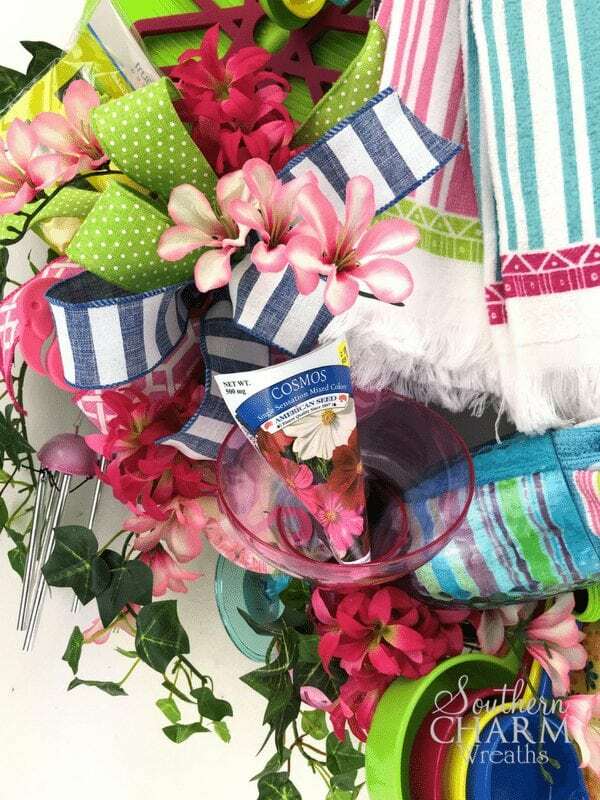 While I love the objects used, they’d be better suited for a gift basket for my taste. This is the first time I have not absolutely loved what you have created. Thanks for all that you do for all of us. You are greatly appreciated. Too Neat! Too Cool! Right on Point! You always are so creative! I love this idea! Thank you so much for taking the time to show how this beauty is assembled! I love this wreath very different and a wonderful idea!!! Julie, I watched your live on this, I was kinda mixed about it, but at the same time I Loved the finished results. My only thought on the whole thing was they pretty much had a bare wreath when they took everything off and might would prefer a pretty wreath to hang somewhere verses a wreath with a bow and a few flowers here and there, that they would only trash if they are not into being creative with the bare wreath. But it did turn out Beautiful in the end. I’m so glad I found you!! Okay. So this is not my favorite of your wreaths. Having said that, I always learn somrething new from watching your videos. This one is no exception. It is also a wonderful springboard to other ideas for my wreathmaking. Thank you so much for sharing your talents! After I realized those things are removed, really like it. It isn’t something I would make but I’m fine with that. Maybe someone else would really like it! Just not my style. Julie, it’s not my favorite wreath. But good idea to use as something different. I would probably not have used the tray, not sure what I would have used in place of it. Thought it was too large but that’s just my opinion. Good I idea for baby, wedding shower as something new. What a great idea to give a gift! May not hang it on my door, but an optional way to ‘package’ a gift for someone. I shared this video to my page, and I am now making one for my niece to give to my sister for Mother’s Day. It is a little difficult to make since I can’t glue, but it truly is a unique idea. Your creativity goes above and beyond. Hi Julie, I LOVE the idea. Would you be able to place all of this on top of mesh and have a beautiful bow? Maybe add a few more flowers, or something so they could use the wreath once they had taken everything off? Just curious. I can think of several ways to use it but would hate just leaving them with a bare wreath. Either way, I love watching you, which is why I belong to your club! Thanks for all you show us! Julie, I love all your wreaths but this wasn’t one of my favorites. It’s not one I would hang in my home or on my door. It was cute, and I always love your bows, but it seemed the articles would have been cuter if used in a decorated basket, whether for a new home or baby, or Mother’s Day, etc. It would be a unique raffle prize, but one to disassemble after winning. Thanks for all your help, Julie. Yes, it is absolutely meant to disassemble by who receives it. Just a unique way to give a gift. I watch you make this. The idea I think is a great one for a house shower but not for a Mother’s Day one. I think what throws it off for me is the towels it covers up most of the prettiness of if? You are very talented n love watching your work and I hope I haven’t offended you in any way lm not meaning to in no way. I liked it as I said just don’t think it would be for Mother’s Day unless it was inspired by a teenager to make for their mother it would ne more appreciated by a younger child making it for Mother’s Day from Girl Scouts etc. it would by all means to me be more loving gift for a mother. From her child. hugs,n prayers. I enjoyed watching you make the Mothers Day wreath. I might have tried some double sided tape and put a couple things on the tray. Would wired ties have been easier? I might try one. Bi am making one for a fall Chinese auction in September. Where can I post what I made to show you. Again like you said, I am a big girl. Julie, I love the wreath! I’m all about unique and different and this wreath is one of a kind! I adore you and think very highly of you and the items you design. This one though, looks like a HOT mess. I feel like everything is just thrown on (including the kitchen sink, practically). I think if you didn’t add the measuring spoons, measuring cups & the hot plate trivet it might have worked a little better. 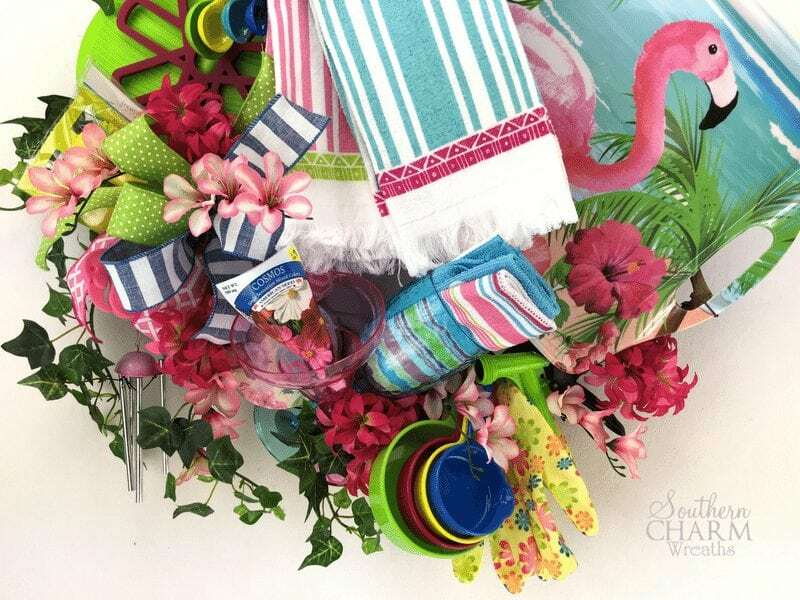 Maybe just using mostly the outdoor items would have been fine or using the flamingo items and the drinking glasses would have been fine, but in all honesty, this looks horrible and I think you could have shown us something fun & funky and out of the box, without using all these items. Again, I love your work, just not this one. Hey Julie, To start, I appreciate all you do! If my mom were here, I might do something similar. She would have thought it was fun. I can just see her taking it all apart! She would have had a ball because she loved to entertain, and she was a baker. I think a wreath like that is meant to be taken apart. I am definitely planning to do 2 graduation wreaths. I have a College graduate and a High School graduate. One for each would be fun. I have actually started looking for things. a few gift cards would be a nice add in. Thanks for the fun idea. I think it is an extremely clever way to give a gift. I think it was meant to maybe make us think of other ways to make something different and unusual. I’m not sure everyone understood it should be taken apart after giving it. My mom who is ninety wouldn’t think much of it, but for a younger , outgoing mom who has creative tastes it would be amazing. We will never please every one , every time. I love your work and your spirit. Thank you for sharing your talent with us. Personally, I loved the colors and the techniques involved when I watched your live. For my eye, which is very inexperienced still, it is too busy. I loved the idea of it and even thought of trying something like it a while ago, but I couldn’t close in on the design I wanted. Please don’t stop showing us different concepts though. Adorable. Outside of the box. !!!! I saw cute things at Dollar Tree, but could not think of how to put it all together. I like some of the kitchen items for a house warming gift. Maybe with some basil in the cup. I wonder if the tray would work in the back?